In 2012, Guinness World Records named Tao Porchon-Lynch the oldest yoga instructor in the world. 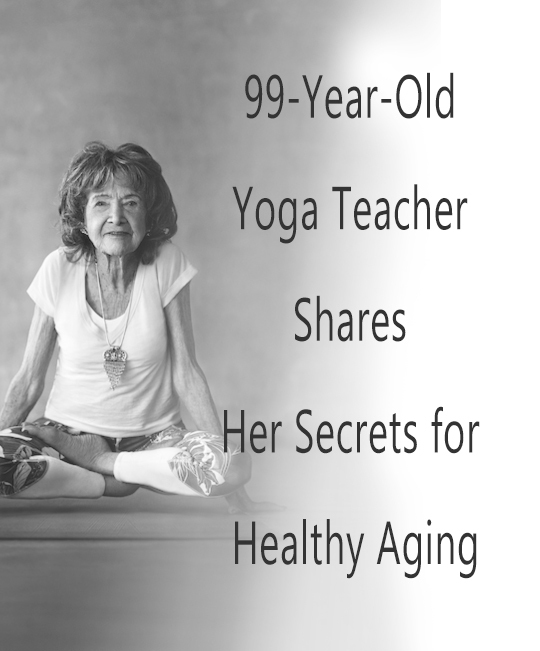 Now, she's 99 years old — and still teaching yoga at her New York studio. How's that for healthy aging? 1. She's in touch with her breathing. If teaching yoga for 75 years has taught Porchon-Lynch anything, it's that mindful breathing can have surprisingly powerful effects. And she's right — experts say that slower, deeper breathing can help us reduce anxiety, improve focus, fight pain and even help in the prevention of diseases, such as diabetes. "When you are in touch with the breath, there is no such thing as age," Porchon-Lynch told the Huffington Post. "Nothing is impossible when you are in tune with your breath." Porchon-Lynch says yoga helps people look at things in a more optimistic way and melts away stress. (A reminder: Stress can negatively affect your body in many significant, physical ways, including increasing your heart rate, blood pressure and risk of heart attack or stroke, and messing with your weight and digestive system.) "Never put negative thoughts in your mind because it goes right into your body," she said. "When you wake up in the morning, say, 'This is going to be the best day of my life.'" 3. She still practices yoga every day. Even at age 98, Porchon-Lynch finds a way to make fitness a part of her daily routine: She wakes up at 5 a.m., gets to her studio by 8:30 a.m., and teaches several yoga classes per day. And that's just the tip of her active-lifestyle iceberg: Earlier this month she took 1,000 students on a retreat to the Bahamas, and in February she'll make a trip across the country for a dance competition. Plus, she and fellow yoga teacher Terri Kennedy are two of the new faces for Athleta's Power of She campaign! (Watch their video for the campaign below.) Color us ommm-pressed.